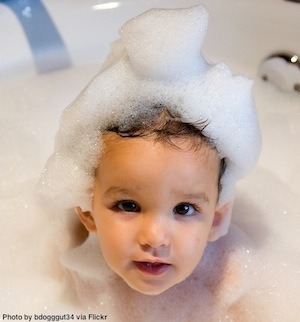 “Why is bath time so hard?” – Rubber ducky is NOT the one! Bath time is not hard just because it is the bath. One of the first problems is when bath takes place. Not necessarily the time of day (although this can be important too), but where in the series of events does bath time occur. Is it after dinner, after homework, after TV time and right before bedtime? Another problem comes from what they do after bath time. If your kids go to bed right after taking a bath, bath time is like the Krispy Kreme “HOT NOW” sign except the sign is blinking, “Your night is over, pal…” Bath time stinks because they know what is coming next: bedtime, and that is generally not fun. Combine the two, and you have a problem: most preferred activity to lesser preferred activity to least preferred. Bath time is NOT likely to happen. So, have I convinced you its not about the water, the soap or the terrible “Rubber Ducky” song you try to sing to make it all better? No soapy crayons or Mickey Mouse sponges will be likely to help this situation. Here is the suggestion: think about your evening routine. Set things up for your advantage. Least preferred things (bath time, tooth brushing, picking out clothes for tomorrow) happen first, then more preferred things (Wii, TV time, computer time, preferred book time). Control access to those things so you dont get stuck taking them away from games or TV. Don’t get stuck on the “it needs to happen now” thing. Let the motivation of access to preferred things work. Stand back. Don’t force it. Wrestling your kid into the bath will not work out for you (or them). Warning…you might have to be OK with a bath not happening or the teeth not getting brushed a few times to make sure the contingency sinks in. A night without a bath or furry teeth are not worth the continued struggle and fight. If it happens over and over, you need to find things that are more motivating…your Wii has lost its power. This entry was posted in Uncategorized and tagged boundaries, compliance, prevention, teaching by BehaviorBandAid. Bookmark the permalink.